What do a flea and an eagle have in common? They can store energy in their feet without having to continuously contract their muscles to then jump high or hold on to prey. Now scientists at Queen Mary University of London and University of Cambridge have created materials that can store energy this way, be squeezed repeatedly without damage, and even change shape if necessary. These kinds of materials are called auxetics and behave quite differently from regular materials. Instead of bulging out when squeezed, they collapse in all directions, storing the energy inside. Current auxetic material designs have sharp corners which enable them to fold onto themselves, achieving higher density. This is a property that has been recognised recently in lightweight armour designs, where the material can collapse in front of a bullet upon impact. This is important because mass in front of a bullet is the biggest factor in armour effectiveness. The sharp corners also concentrate forces and cause the material to fracture if squeezed multiple times, which is not a problem for armour as it is only designed to be used once. In this study, published in Frontiers in Materials, the team of scientists redesigned the materials with smooth curves which distribute the forces and make repeated deformations possible for other applications where energy storing and shape-changing material properties are required. The work lays the basis for designs of lightweight 3-D supports, which also fold in specific ways and store energy which could be released on demand. Principle investigator Dr. Stoyan Smoukov, from Queen Mary University of London, said: "The exciting future of new materials designs is that they can start replacing devices and robots. All the smart functionality is embedded in the material, for example the repeated ability to latch onto objects the way eagles latch onto prey, and keep a vice-like grip without spending any more force or effort." The team expects its nature-inspired designs could be used in energy-efficient gripping tools required in industry, re-configurable shape-on-demand materials, and even lattices with unique thermal expansion behaviour. Eesha Khare, a visiting undergraduate student from Harvard University who was instrumental in defining the project, added: "A major problem for materials exposed to harsh conditions, such as high temperature, is their expansion. A material could now be designed so its expansion properties continuously vary to match a gradient of temperature farther and closer to a heat source. This way, it will be able to adjust itself naturally to repeated and severe changes." 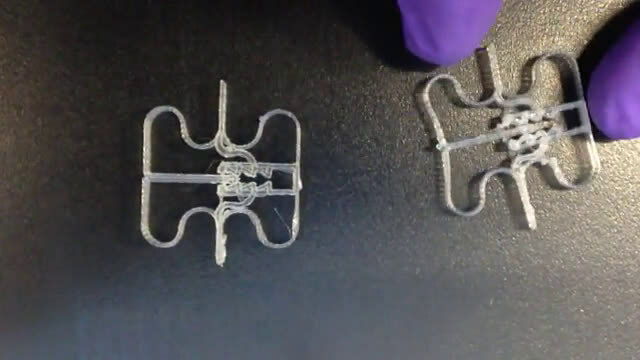 The flexible auxetic material designs, which were not possible before, were adapted specifically to be easily 3-D-printed, a feature the authors consider essential. Dr. Smoukov added: "By growing things layer-by-layer from the bottom up, the possible material structures are mostly limited by imagination, and we can easily take advantage of inspirations we get from nature."